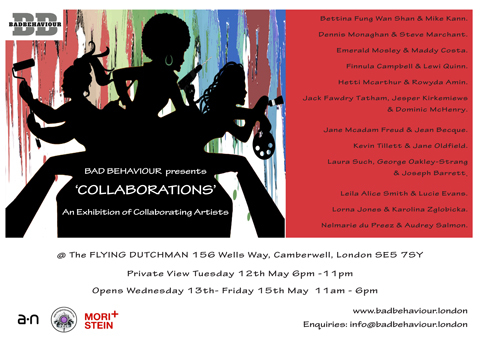 Exhibiting Artists: Dennis Monaghan & Steve Marchant, Emerald Mosley & Maddy Costa, Finnula Campbell & Lewie Quinn, Hetti Mcarthur & Rowyda Amin, Jack Fawdry Tatham & Jesper Kirkemiews & Dominic McHenry and 9 more. 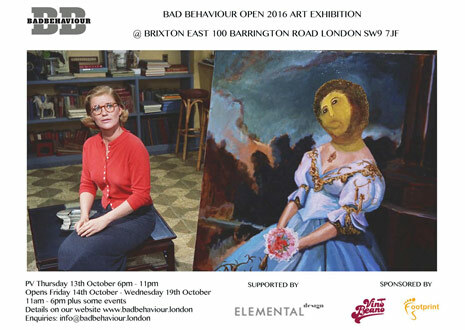 Exhibiting Artists: Tete de Alencar, Murray Anderson, Indrani Ashe, Tony Beaver, David John Beesley, Monica Bonomo, Jason Brown, Stathis Dimitriadis, Stephanie Douet, Philip Elbourne and 30 more. 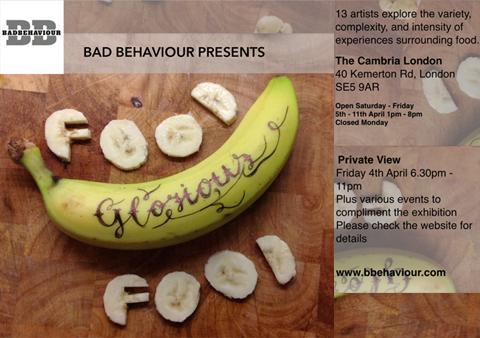 Exhibiting Artists: Tom Banks, Tony Beaver, Serge Constantinesco, Lucie Evans, Mars Gomes, Caro Halford, Araba Ocran, Jane Oldfield, Chantelle Purcell, Deborah Ridley and 3 more. 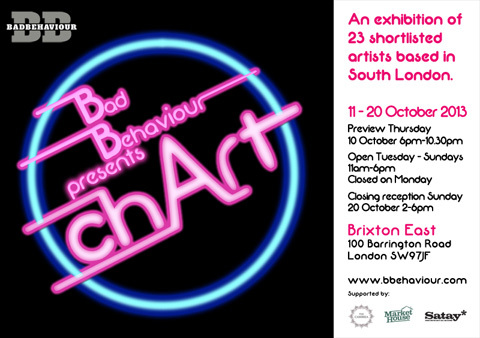 Bad Behaviour presents chArt, a group exhibition that investigates the relationship between music and visual arts. Exhibiting Artists: Nicholas Allan-Pui, Juliette Argent, Tom Banks, Amelie Barnahan, Roy Bell, Dunstan Bruce, Julian Carstairs, Paul Churcher, Serge Constantinesco, Jim Cross and 12 more. 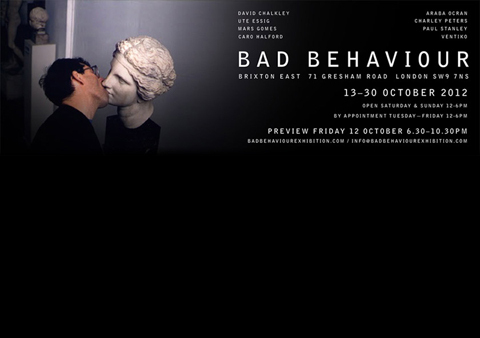 Brixton East is delighted to announce its inaugural exhibition, Bad Behaviour, a group show bringing together the work of eight artists: David Chalkley, Ute Essig, Mars Gomes, Caro Halford, Araba Ocran, Charley Peters, Paul Stanley and Ventiko. Although working in diverse ways across many different media, the artists are unified in the subtle, compelling and poetic ways in which they handle their chosen themes. 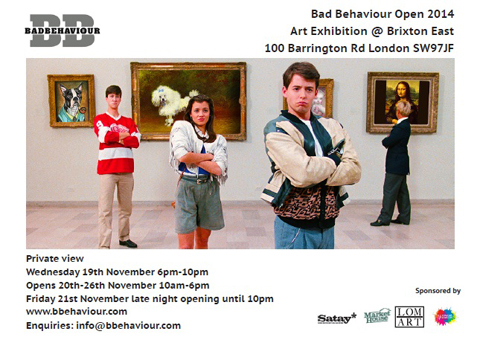 Exhibiting Artists: David Chalkley, Ute Essig, Mars Gomes, Caro Halford, Araba Ocran, Charley Peters, Paul Stanley, Ventiko.